Cardiff - Hadleigh Parkes will become the latest New Zealander to play for Wales after he was named at centre for their one-off Test against South Africa on Saturday. Parkes has shone for Scarlets since signing for the Welsh region and qualifies for Wales after serving the three-year residency rule, which handily comes up on Saturday. The 30-year-old benefits from the absence of Owen Williams and Jamie Roberts, who have both returned to their English clubs as the fixture falls outside the international window. Wales coach Warren Gatland, himself a New Zealander, has made four other changes to the team that lost 33-18 to world champions New Zealand last week. Aside from Parkes, Aled Davies takes over at scrumhalf in the other change in the back-line. Parkes will partner regional team-mate Scott Williams in midfield, with Davies lining up alongside Dan Biggar at halfback. Leigh Halfpenny, Steff Evans and Hallam Amos feature in an unchanged back-three. There are three changes in the pack with Kristian Dacey and Scott Andrews coming into the front row alongside Rob Evans. Second row Cory Hill packs down alongside captain Alun Wyn Jones and it is an unchanged back row of Aaron Shingler, Josh Navidi and Taulupe Faletau. 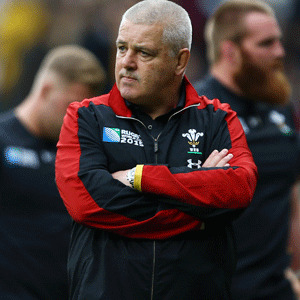 Faletau's selection will be sure to raise the ire of the English Premiership. The No 8 is understood to have a contract with his English club Bath that sees him available for Tests, but the club will now likely be hit with a fine for releasing him. "Saturday is an opportunity to continue to build on what we have done so far and round off the autumn campaign with a big performance," said Gatland, whose team opened their autumn campaign with a 29-21 defeat by Australia and went on to record a scrappy 13-6 win over Georgia. "We have spoken about exposing the squad to Test match rugby and this weekend is a great opportunity for Hadleigh to earn his first cap and for Aled to make his first start of the campaign. "We have had a couple of knocks from last weekend, with Ken Owens, Leon Brown and Jake Ball unavailable but that just provides an opportunity for Kristian, Scott and Cory to start." Elliot Dee, Wyn Jones and Rhodri Jones provide the front row cover. Seb Davies and Dan Lydiate complete the forward contingent. Rhys Webb, Rhys Patchell and Owen Watkin are the backline replacements.